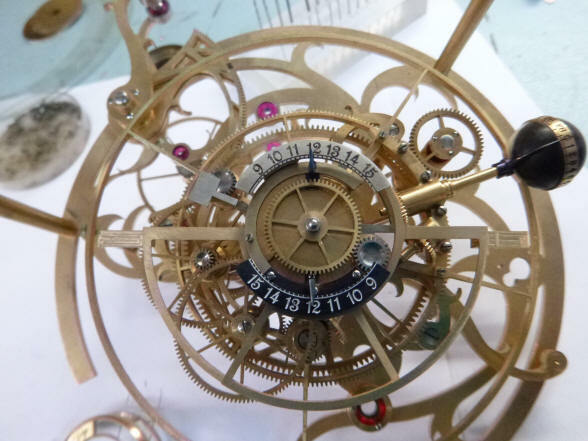 The first photo shows the semi-finished hands for the center hub dial depicting the length of day and night hours. 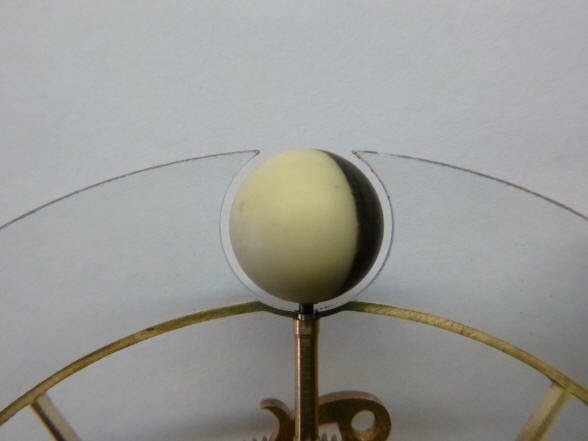 The next photo shows the initial dial mask for these two indicators. I will reserve judgment on this for now; it appears to be a big blank cover, the opposite of what we try to do with trying to expose as much of the machine as possible. 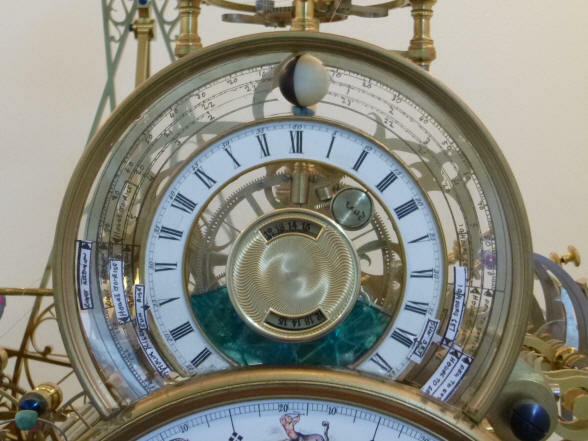 The center dials on the sun / moon rise-set mechanism depict the length in hours of each. 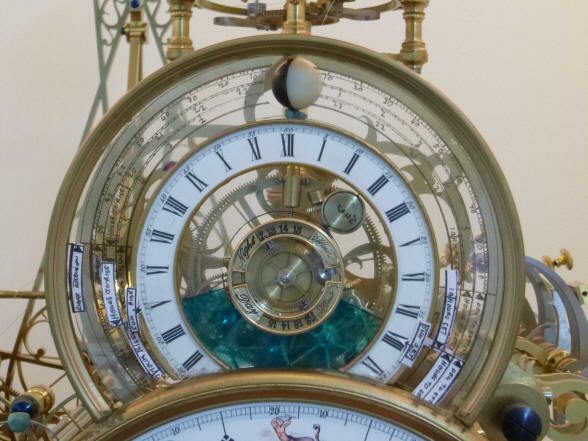 Notice that BOTH the dial hands and the dial numbers move past each other. 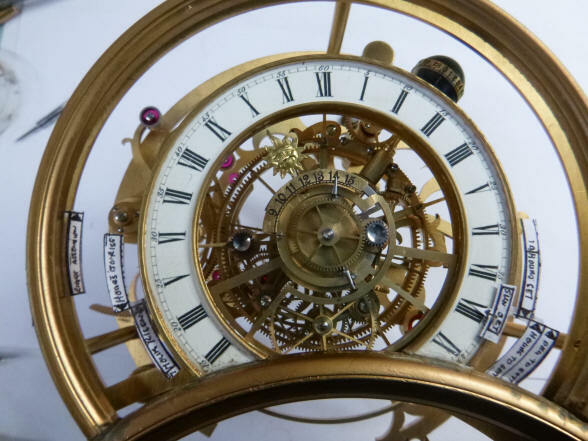 This allows for a greater sweep of the hand across the face of the sector dial and was necessitated because of the small movement that would be had from only having the dial hand in motion. 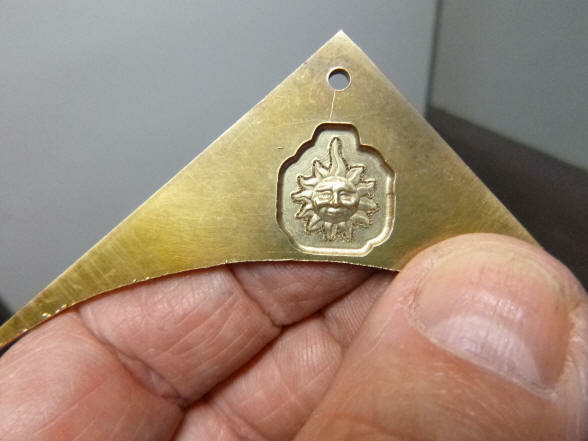 This is the first design concept for the center dial within the sun/moonrise dial set. 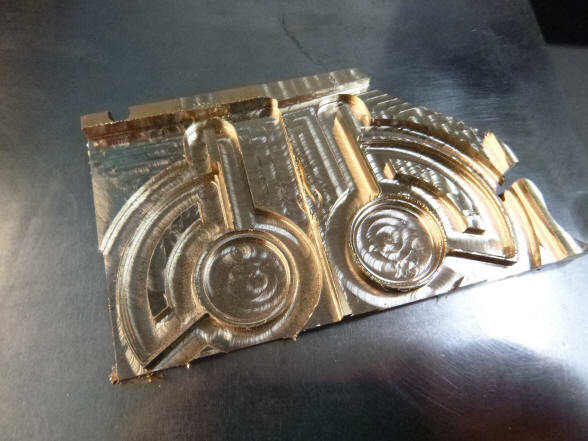 The first picture is a photo of the CNC design from the computer screen; next a proof-of-concept initial brass engraving. 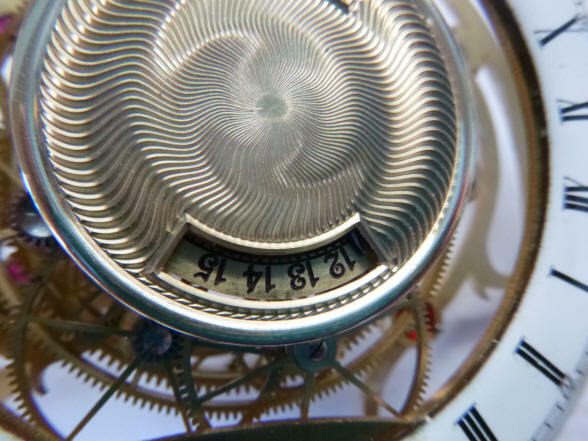 Even though the pattern is beautiful, I want to steer away from a central disk with two apertures for hours of day and hours of night sector dials as shown here. I’d prefer that the two sector apertures be ‘floating’ in front of the numeral dials behind. 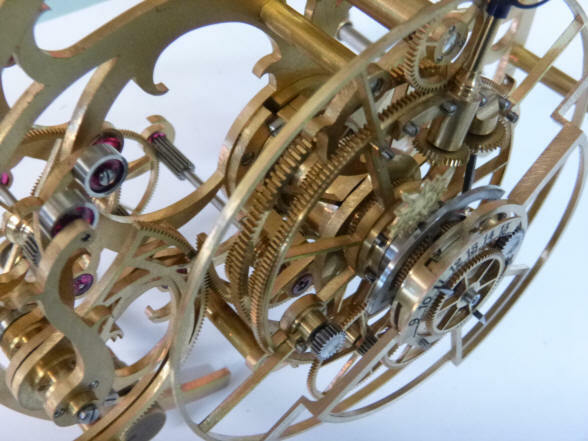 This is in keeping with the bezel we created for the digital readout of the year in the calendar dial cluster. 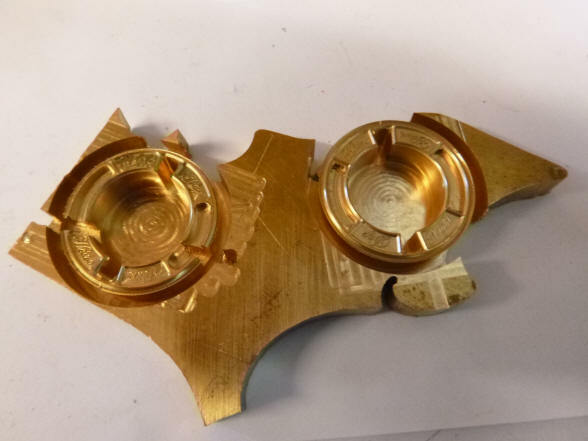 While the damascene machining is nice, there is still too much of the center covered. Here is a side by side comparison. 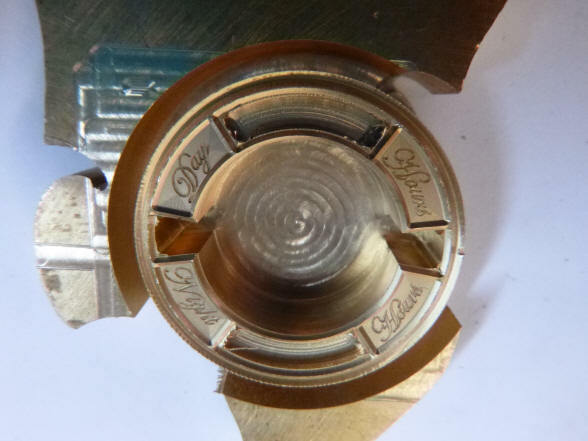 I know many people will like the fancy machined cover on the left, but the dial on the right has the advantage of having space for the labels and we have to this point always tried to show as much mechanism as possible. 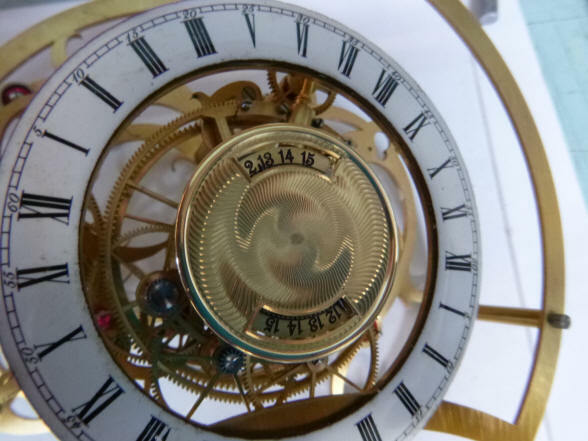 Furthermore the numbered dial plaques also move in the opposite direction to the dial pointers. 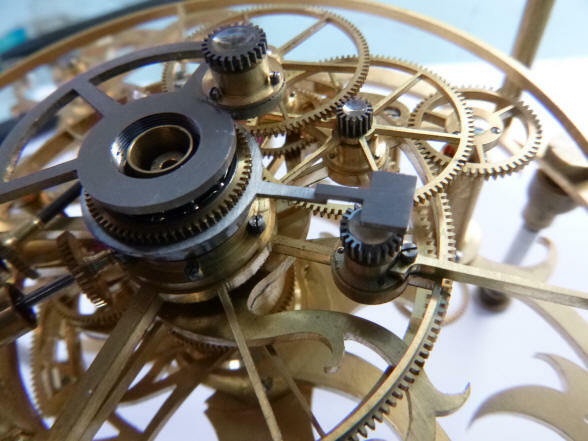 This allows for a greater perceived sweep of the hand over the dial than could be had with the dial pointers being driven over a stationary dial. 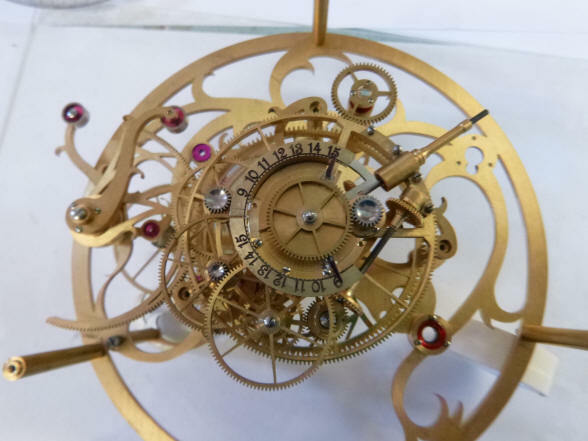 This clever artifice was necessary because the size of the cams and their followers would not deliver enough movement to make the hand sweep over the entire dial if it were stationary. With the open design one will more readily see this arrangement. 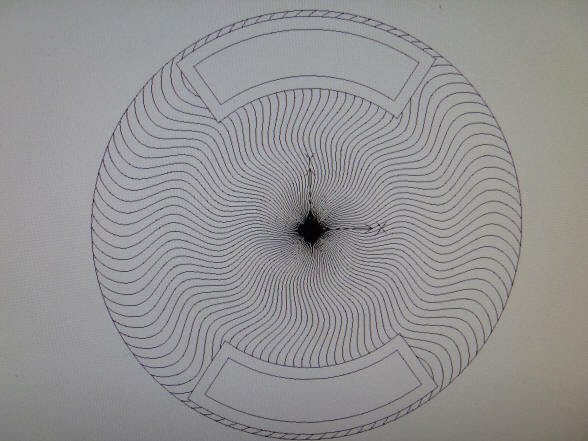 The center wheel will have a decorative center boss and may be redone with a more decorative spoke design. 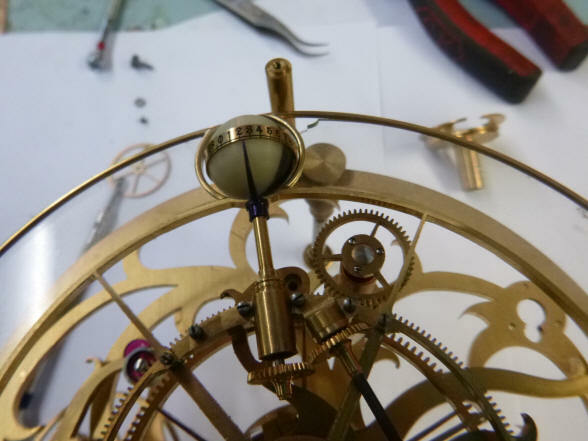 We now turn to the fabrication of the glass dial and horizon shutters. 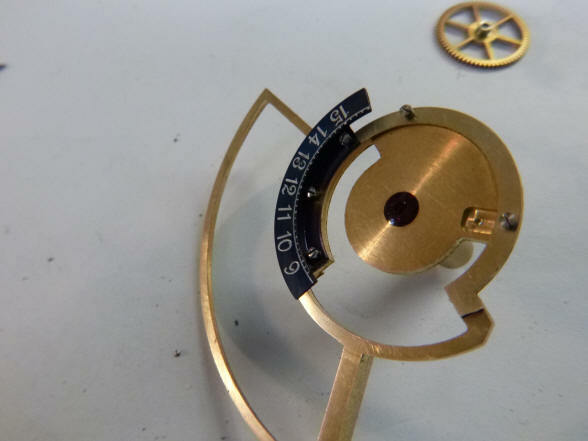 The dial specifications call for very a thin glass of no more than 1.2 mm (0.047”) for the dial as well as the shutters. 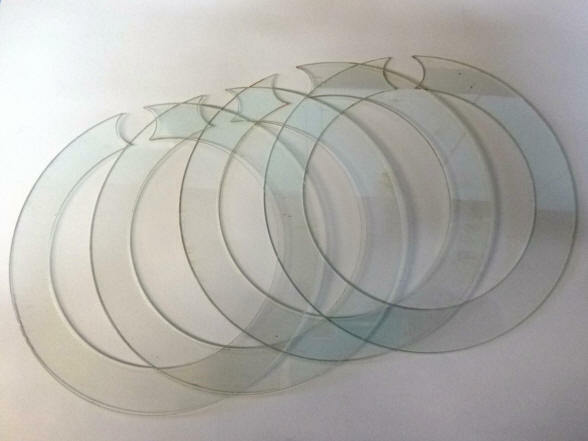 To compare, the standard single strength window glass in the US is 2.38 mm (3/32”). Buchanan was having a difficult time finding this. 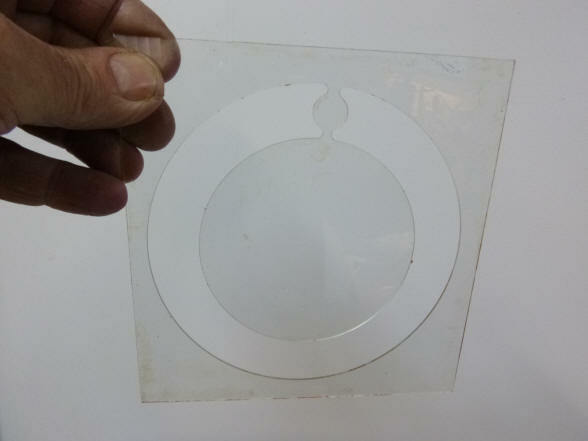 I had found that cheap picture frame glass found in the local discount store has thinner glass which I had found useful in some of my antique time lock restoration work. He was able to source this same glass from a local store. 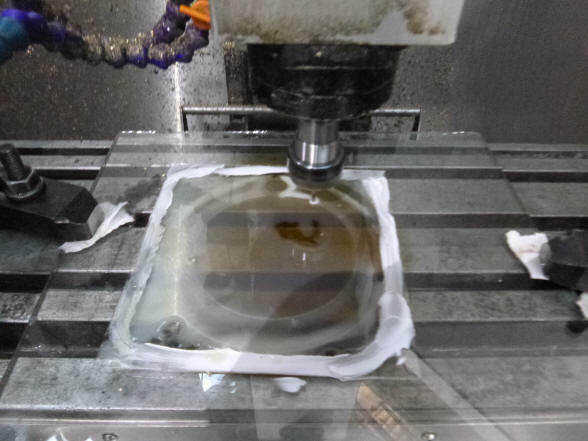 Buchanan writes: I have also had some success with the glass machining. 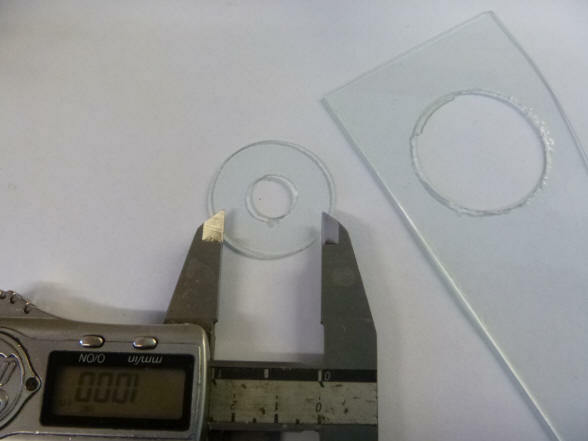 As you can see from the photos I cut a donut of glass 1 and 1/3 of an inch in diameter from a sheet of 1.2 mm glass. 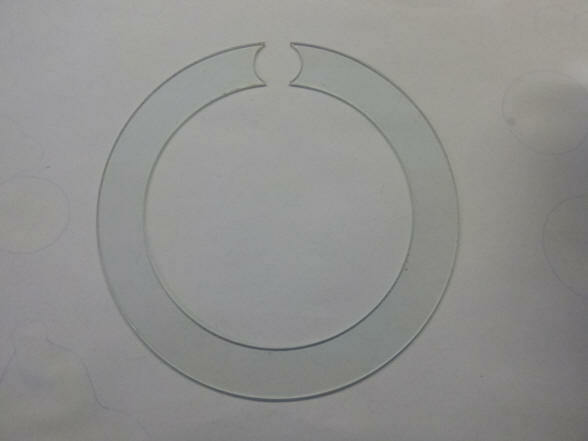 This glass was clamped by its edges against a block of aluminium and machined out on the CNC mill with a diamond burr. There as a little roughness on the edges but it is almost acceptable like it is. In the next photo you can see I have glued the thin sheet of glass onto a thick sheet of glass with shellac. I am going to see how much that will stop splintering when we reach the other side. 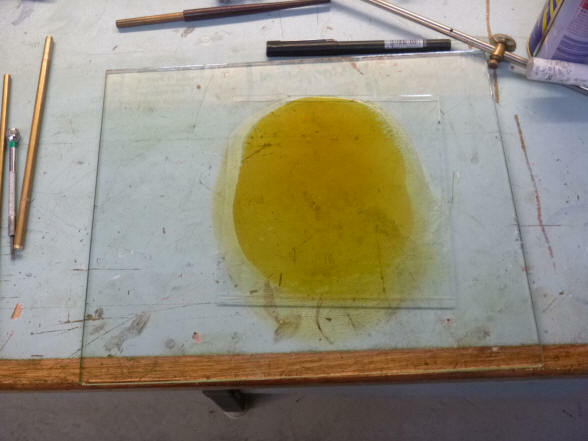 I am thinking that there will be no stress in the glass as they have both the same thermal expansion and when I warm it up in an oven afterwards I can just slide the thin sheet off and dissolve the rest of the shellac with methylated spirits. I am rather hopeful that this will work well. 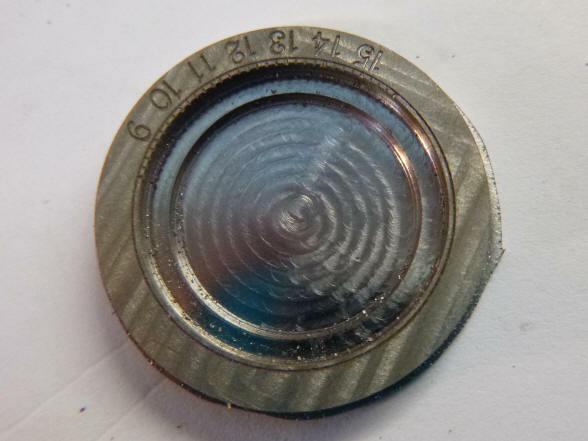 The CNC-controlled diamond burr is used to cut the glass dial. 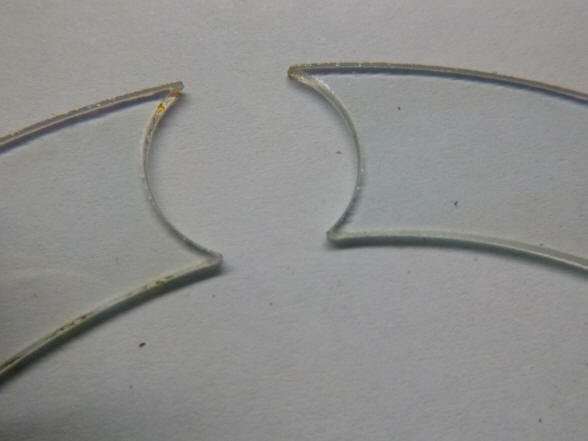 The result with the glass being shellacked onto another piece of glass backing is extremely good. Look at the fine edges and imagine how delicate this 1.2 mm thick open glass ring is. 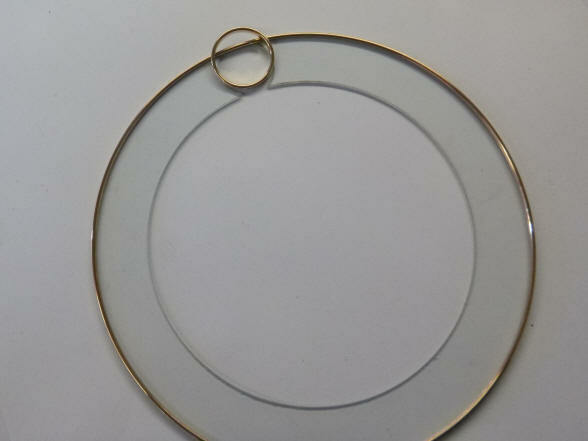 The second photo shows the perfection of this process, the open ring was successfully cut out from the background piece of glass without the center disk breaking away from the extremely narrow neck, next the open ring. The revolving moon will be located within the circular area. Given how fragile this piece is Buchanan decided to make a few spares. 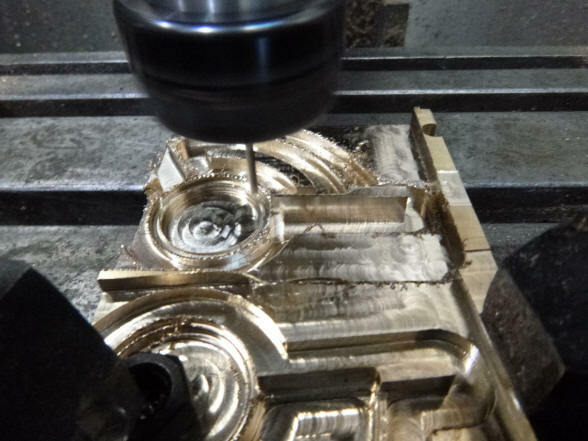 The inner bezel ring is machined. 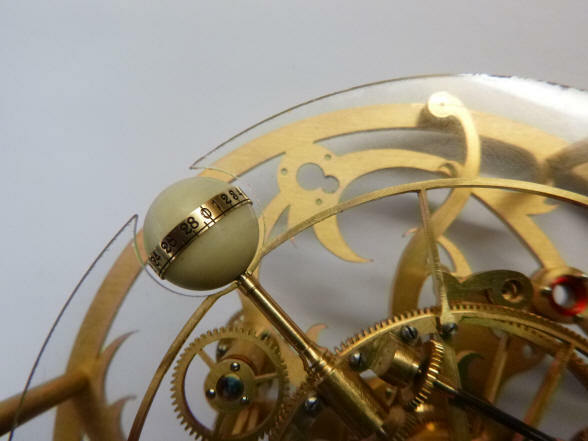 Next it is positioned on the delicate glass dial to check for fit. As one can imagine there is not a lot of room for error. 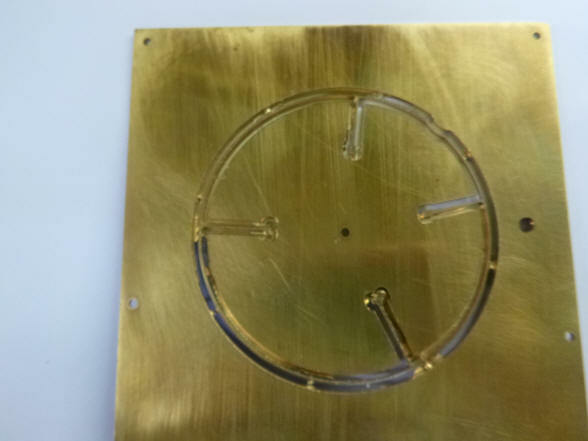 The glass is held to this bezel mechanically not with adhesive. 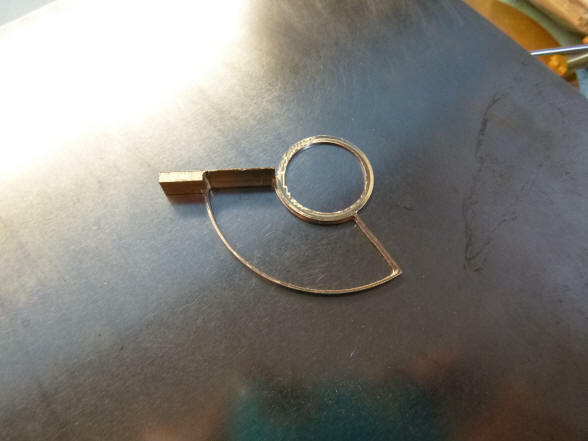 There is a small channel cut into the perimeter of the ring for the glass to attach. 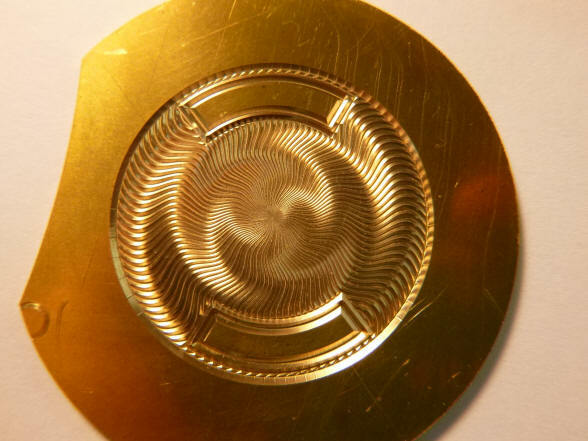 This is made possible by the fact that it is a C–ring and so has some flexibility to do this. A delicate frame for the delicate glass. Next a close up of the moon sphere within the open area of the glass. The frame has yet to be finished, at this point it has a flat edge which will latter be rounded. 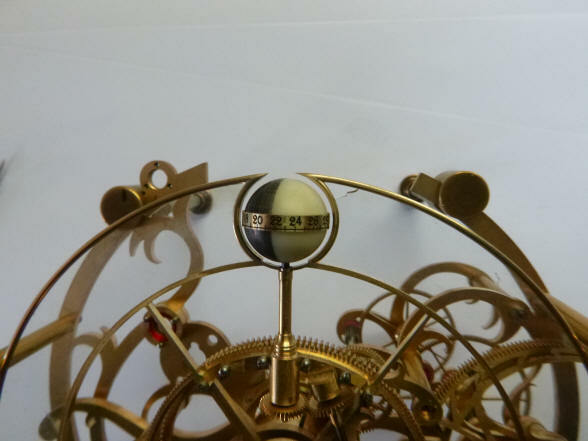 The glass is now attached to the complete sun / moon indicator drive. 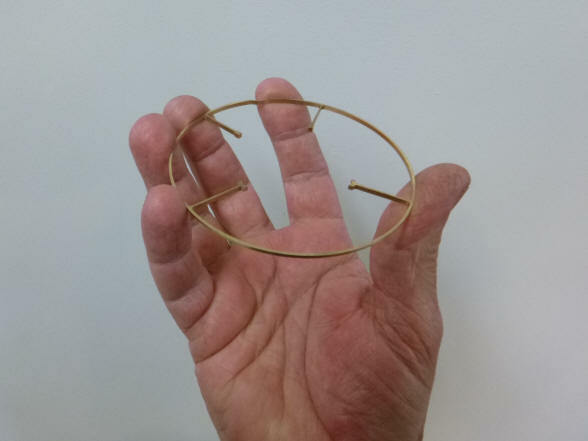 It is easy to sometimes imagine the parts to be larger than they really are, here Buchanan's hand gives one a perspective as to the small size of these components. 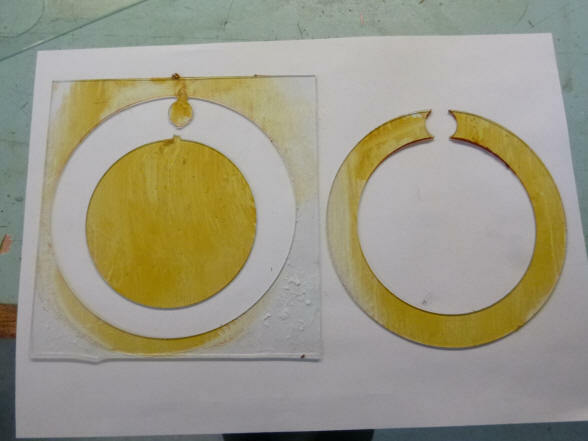 A brass blank is turned for the age-of-the-moon indicator ring; next the completed ring around the mockup plastic moon. 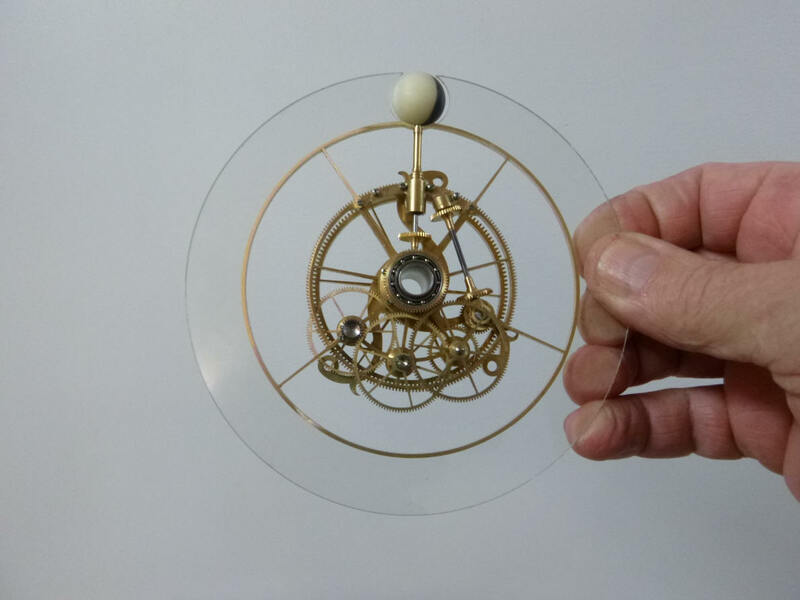 The finished moon will be the same diameter as the ring leaving it counter-sunk within the globe for a more elegant presentation. 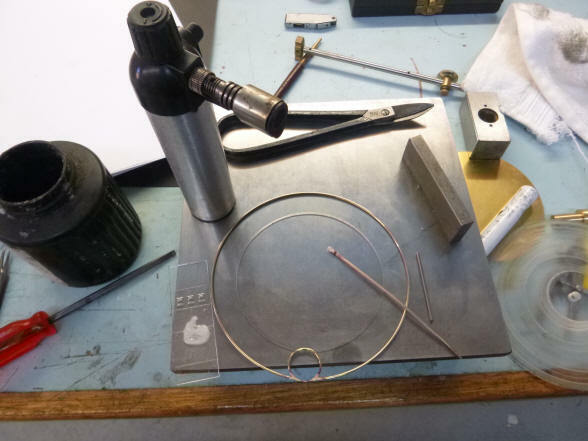 The ring for framing the moon is prepared for soldering to the outer glass bezel. 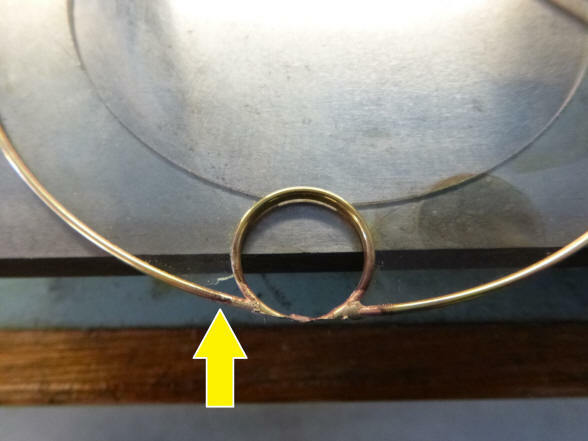 Here the ring is silver-soldered to the frame and one will notice the glass broke at the 7 o’clock position (yellow arrow). Good thing Buchanan made those extra glass rings. Next the mockup moon is positioned within the ring. Notice the top of the ring is open. This allows us to get the maximum moon diameter within the ring as possible; with the ring’s base remaining. 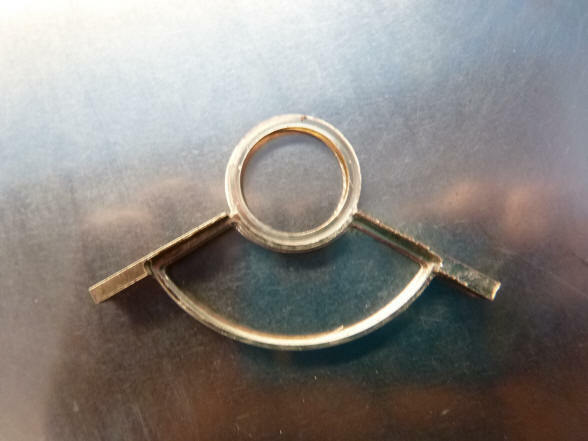 This is a must to retain the glass ring’s structural integrity. 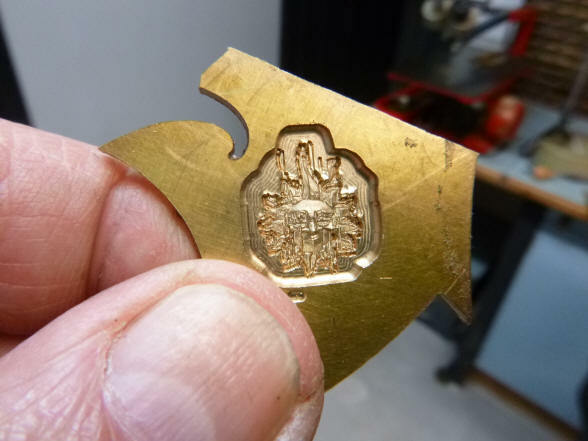 The age of moon hand is fabricated. 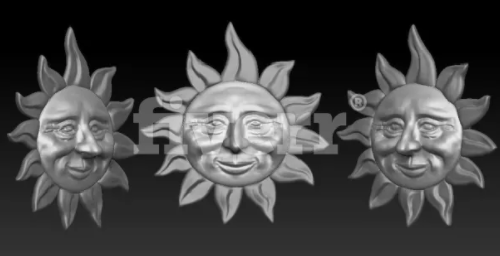 Here the sun, moon horizon shutters are being milled. 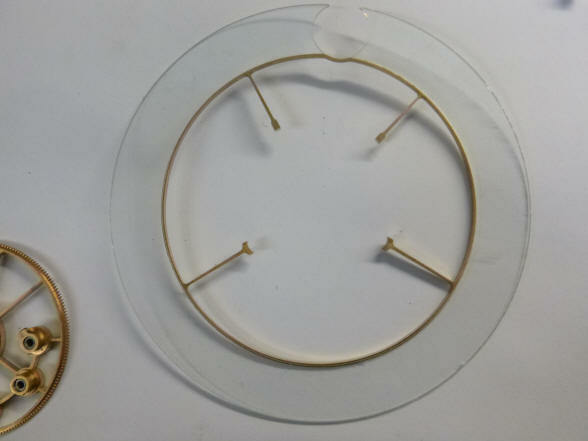 A piece of light blue glass will be inserted into the semi-circular space. Buchanan went on line to look for a computer generated object that could be used on his CAD-CAM equipment to produce a nice representation of the sun for our project (see video below). In the second photo one can see that there was a bug in the program, the face looked like some villain out of a Marvel Comic - well things don't always work out the first time. Finally the mill was behaving and a decent sun was produced. 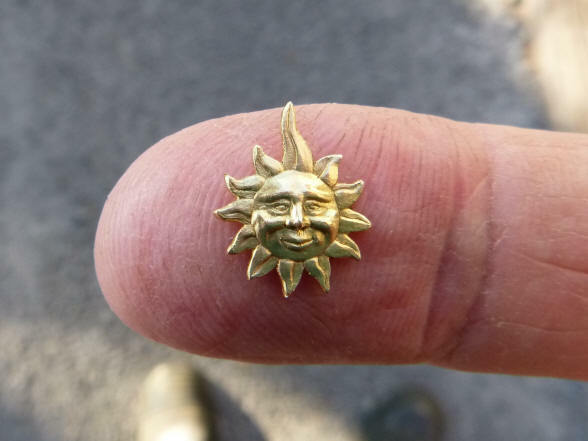 The second photo shows the finished product after further hand detailing and chasing; we have a beautiful sun with a friendly, wizened face. The sun ray at 12 o’clock was lengthened a bit since it will double as an indicator hand. Buchanan pays attention to detail even at these small scales and this being repeated hundreds of times throughout the project makes this machine a piece of art. But he is not yet finished, next month Mr. Sun will be given a pair of blued steel eyes. The sun will be mounted to this pad, next the sun is seen at 11 o’clock. 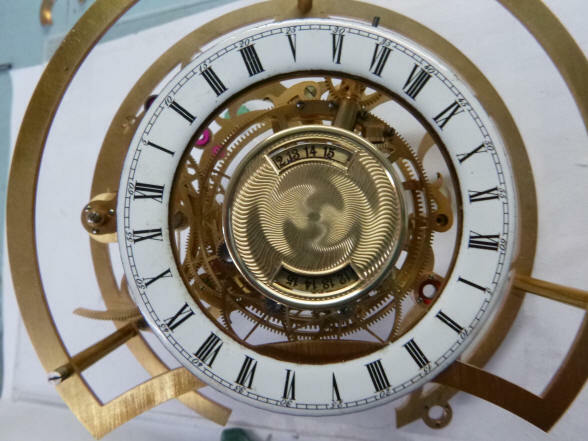 Next the dial is attached to the brass backing. 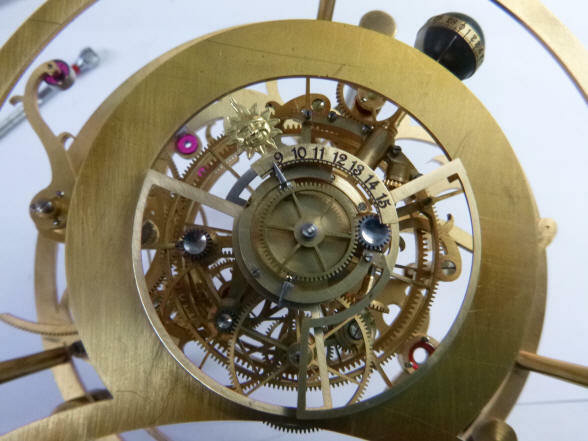 The second photo shows a steep three quarter view from the top revealing the layering of wheels and dial indications. Note the jeweled cam rollers to the left. 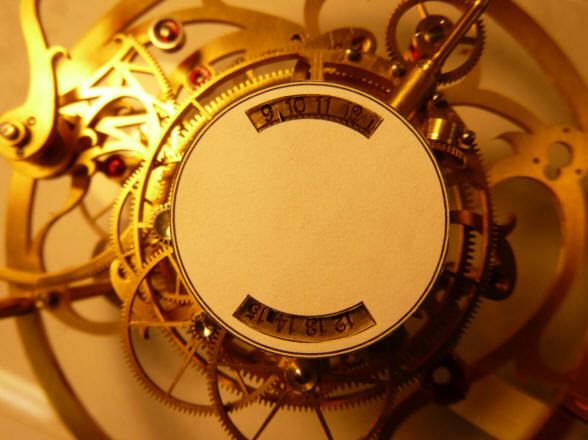 The steel dial for the night hours is fabricated and numbers engraved. 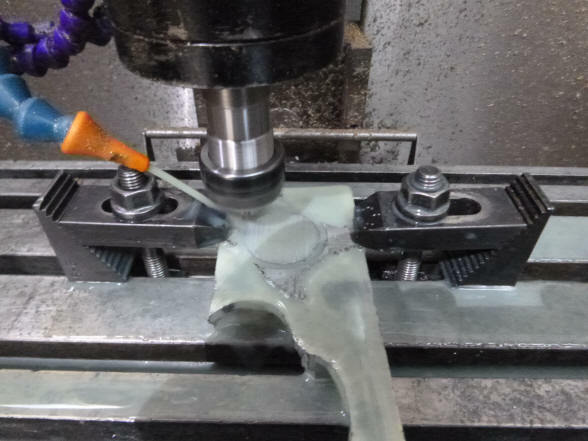 Cutting fluid flows over the part. 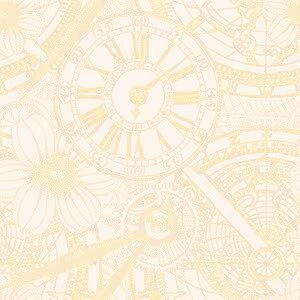 The day hours will be silvered brass. 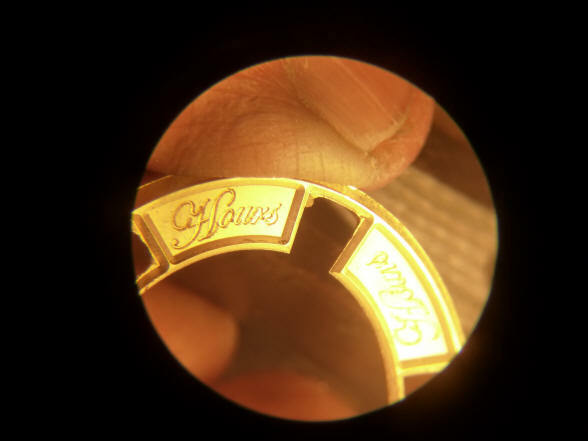 The bezel for the day and night hours is re-machined; the original had the night hours at the top with the day at the bottom, which is counter-intuitive. 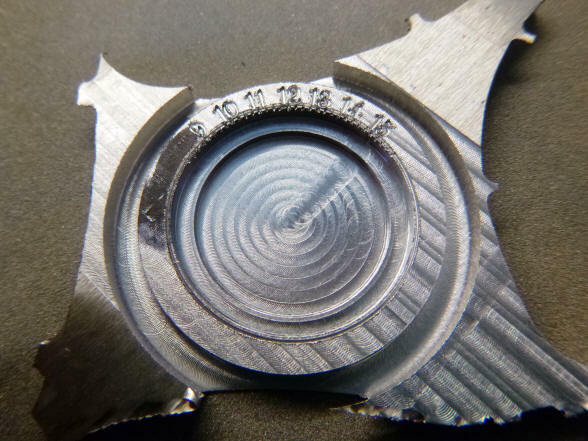 A close up of the cursive engraving. 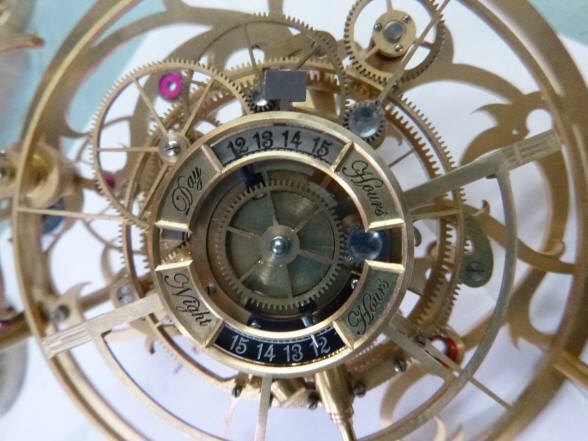 Next the dial labels and integral bezel are complete and in the correct orientation. 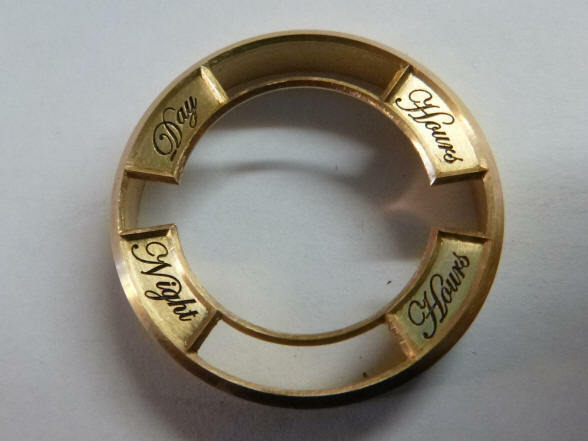 The engraved steel ring blank, first photo, is ready for finishing, second photo. 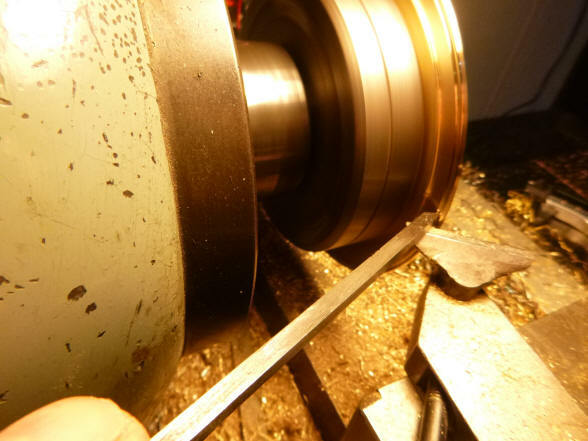 Here Buchanan uses an abrasive stick to finish the surface on his lathe. 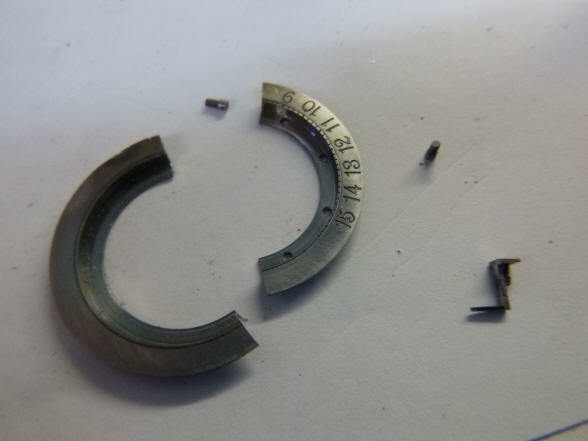 Next the ring is split to create the sector dial which is next mounted to one of a pair of horizon shutters. 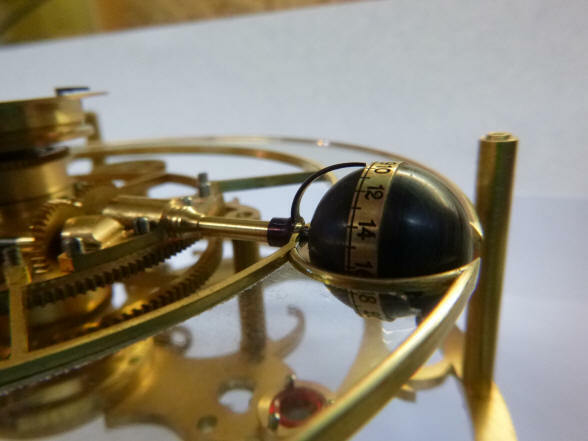 The two sector dials are now mounted to the horizon shutter pair, silvered for the daytime and black background for the night. 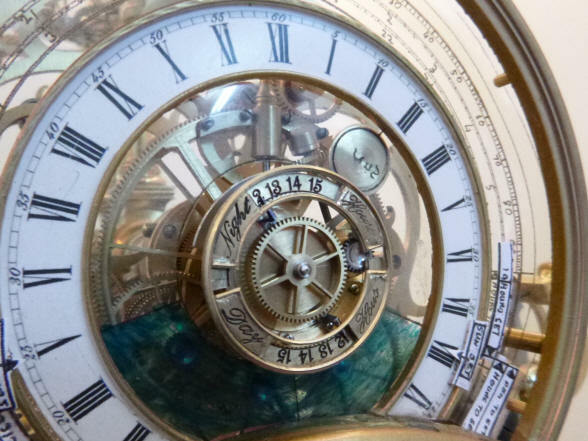 One dial hand is blued for the daytime indicator and silvered for the nighttime; each providing the correct contrast to the dial background. 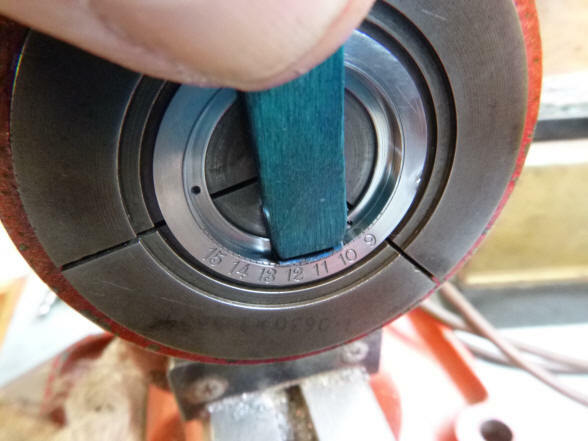 Next the dial label bezel is installed with the correct day / night orientation.